When I first began brewing, I brewed steeped grain/extract beers that never quite tasted like I thought beer should taste. Many online forums attribute this to the “extract twang.” While I don’t necessarily prescribe to this school of thought, given the fact that Ray Daniels book gives many examples of award winning extract beer, I quickly made the switch to all grain. I can unequivocally state that my beer has improved immensely since those early brews. However, was this due to the all-grain switch, or, could this have been because I started pitching an “appropriate” amount of yeast, oxygenating the wort, better temperature control, etc? A simple search of late extract addition yields various claims of “no extract twang” to “better hop utilization” and everything in between. While i’m somewhat skeptical of these claims, I think a comparison experiment will help to provide more solid information in this debate. Though I don’t brew a ton of extract beer, the that fact is a lot of homebrewers use extract as their main ingredient in beer. I thought it would be pertinent to reexamine the use of extract and hopefully dispel some myths out there surrounding the use of extract. Also, as noted in my Small Batch Brewing article, I recently purchased some three gallon carboys. A series of extract experiments will be a great way to break them in and will allow me to complete more experiments at the same time. 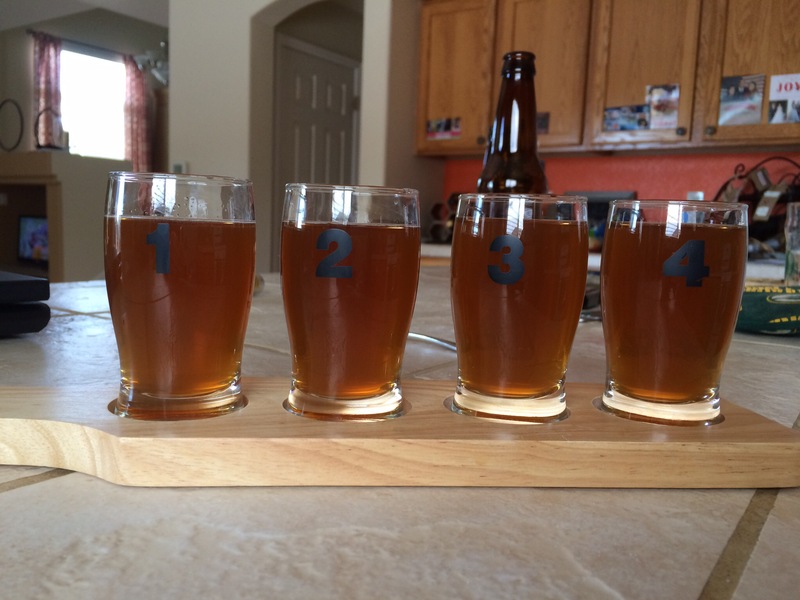 To determine whether or not a beer brewed with extract as the largest percentage of the grist tastes different depending on when the extract syrup is added. 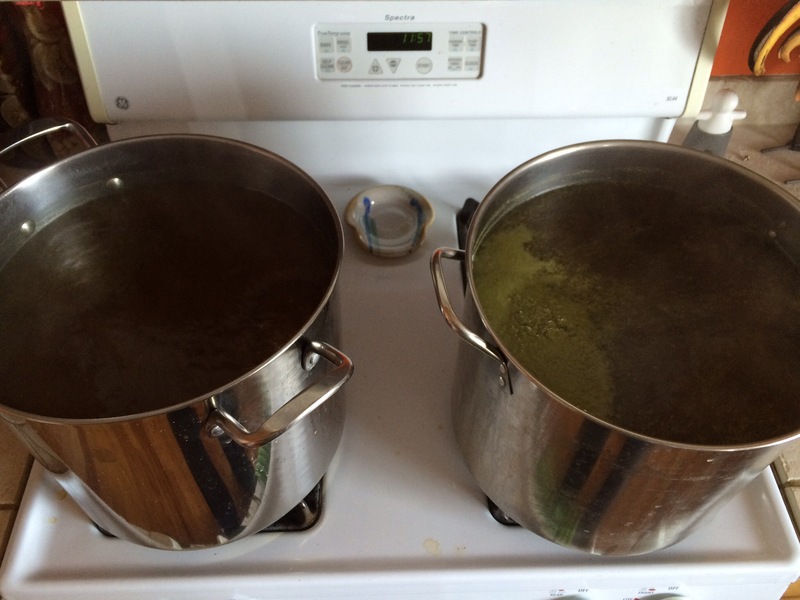 One batch will have the full volume of extract added at the beginning of the boil, while the other will have the full volume of extract added at the end of the boil. 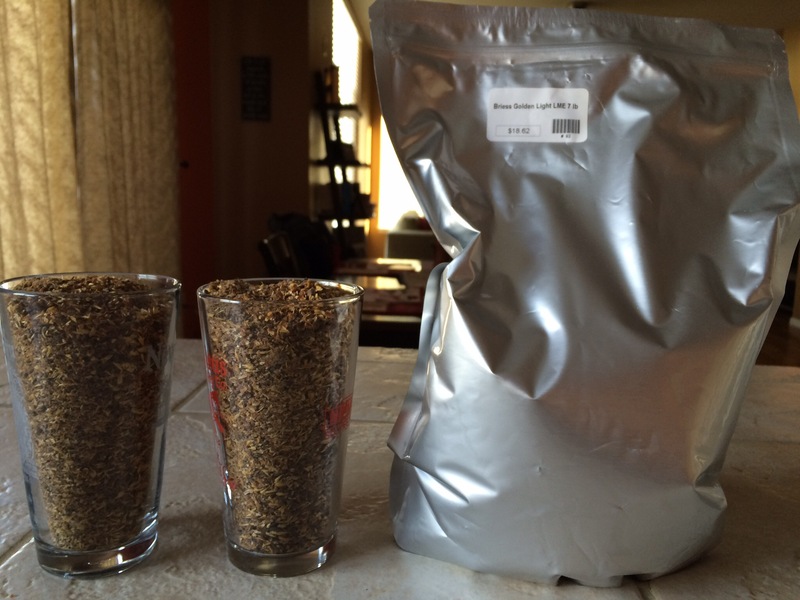 For this experiment I will brew two separate batches of 2.5 gallon steeped grain beer. 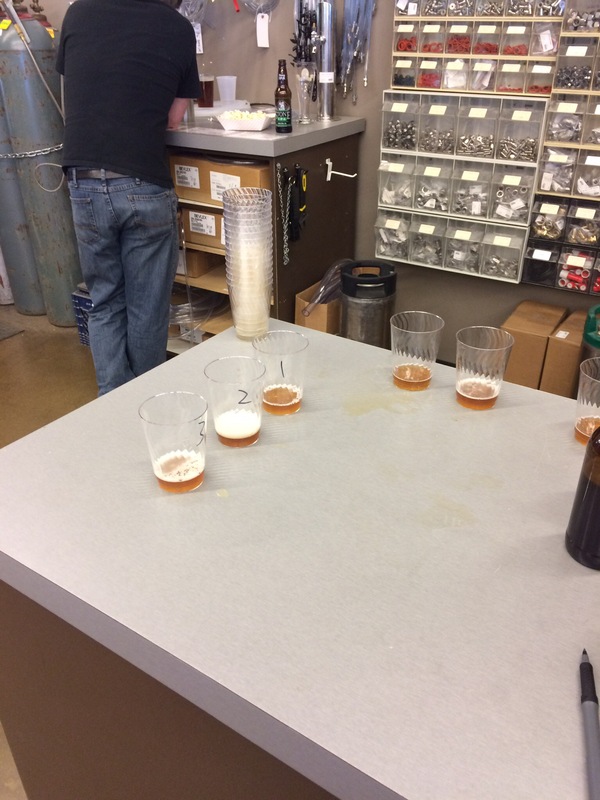 When consulting with the requester on this experiment it was noted that IPA and DIPA tend to mask the extract flavor. 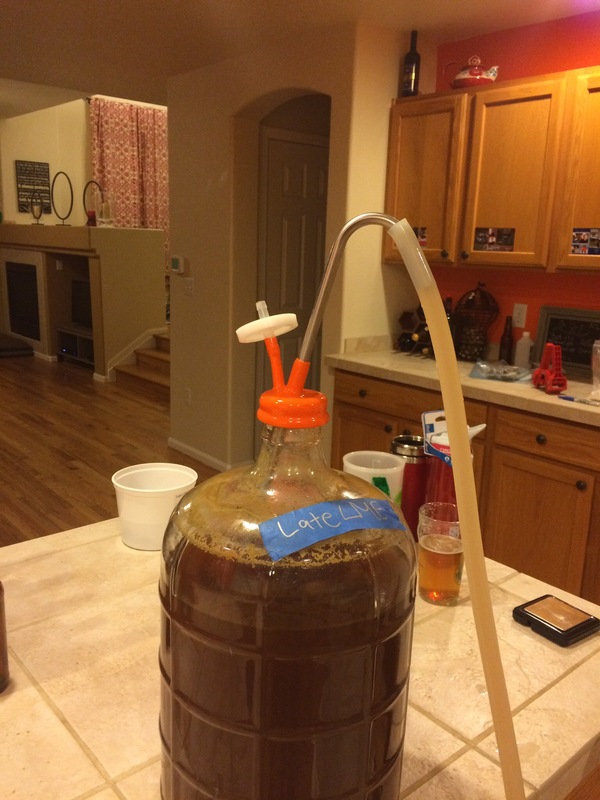 With that being a separate assumption all together, it was decided to brew a fairly standard extract style beer with little yeast or hop flavor to taint the results. 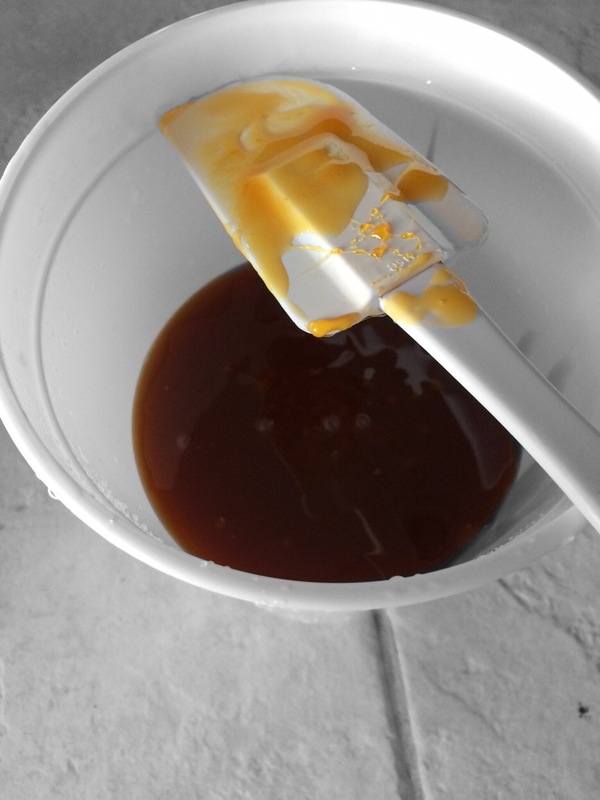 Malt extract added at 60 min for one batch and at 15 min for the second batch. The night before brewing I purchased my ingredients and water. The following morning I did not adjust my water profile to amber balanced as I normally would, due to the fact that malt extract apparently includes the minerals from the mash to create it (John Palmer, How to Brew ch. 4). I then brought my steeping water to 170 degrees using a ratio of 1 gal/lb of grain. The grains were added to the water and steeped for 20 min. After that the boils began and the two processes diverged. In pot one I added the full 3.5# of extract along with the NB hops at the beginning of the boil. The second pot simply boiled with the steeped sugars and NB hops. During the boil I noted that the late extract beer had significantly more hop mass on top of the boil. The early extract beer smelled great, the late beer smelled like hop water. Just for fun I took a gravity reading of the hop water before adding the late extract, the refractometer said 2 brix hah! I didn’t bother taking PH readings during the process because I didn’t think I could really use the information to alter anything. After 45 minutes extract was added to the second pot slowly as to not knock down the boil. 15 minutes later the flames were killed and each wort was chilled to pitching temps in about five minutes thanks to my chilly Denver groundwater. 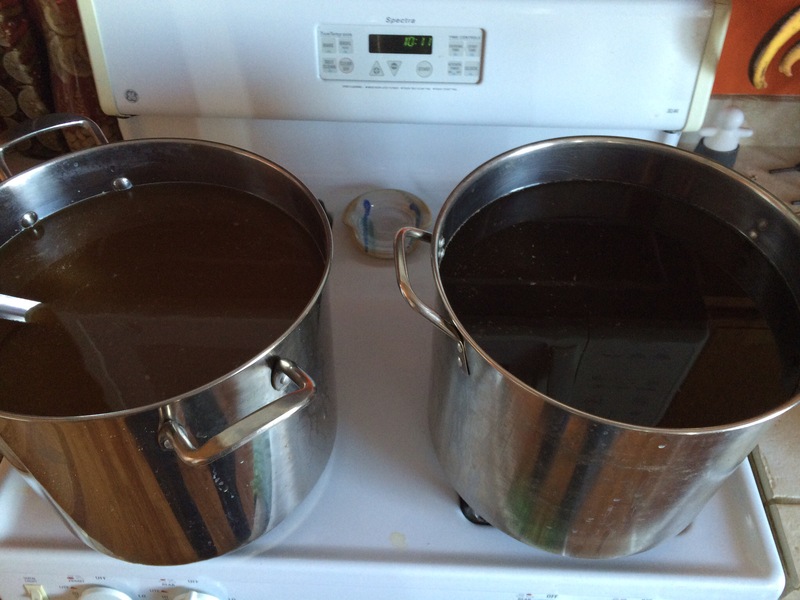 Each wort was hit with 45 seconds of oxygen and the premade yeast starter was pitched equally into each batch. 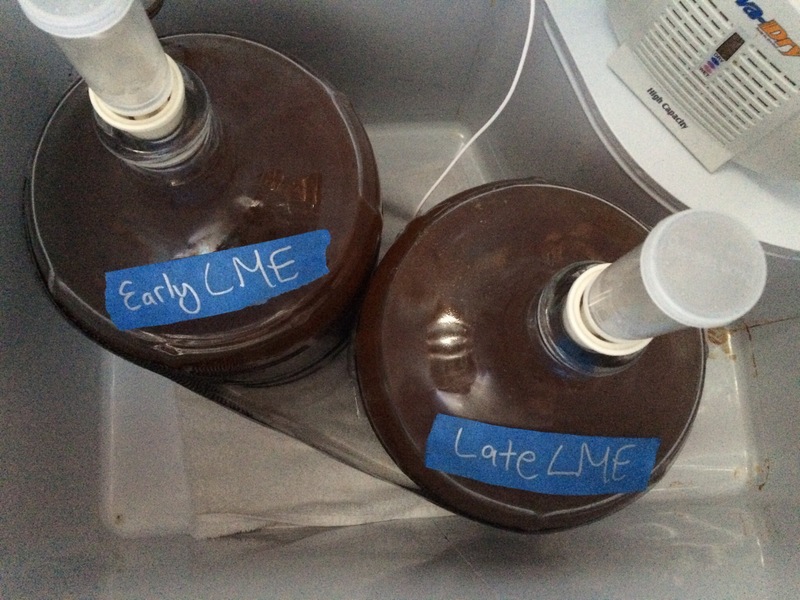 Both beers were placed in my fermentation chamber and set to 62 degrees. 48 hours post pitch. 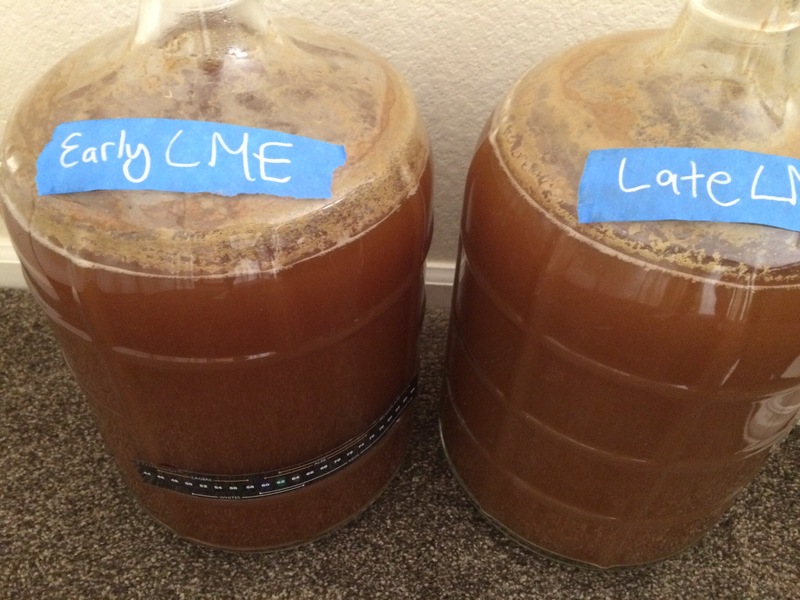 So far there are no discernible differences between the two fermentation. 7 days in the beers were moved to an unused bedroom to finish attenuating. At this point the early LME actually does appear to be darker and have more depth of color than the late LME though it’s tough to see in this pic. 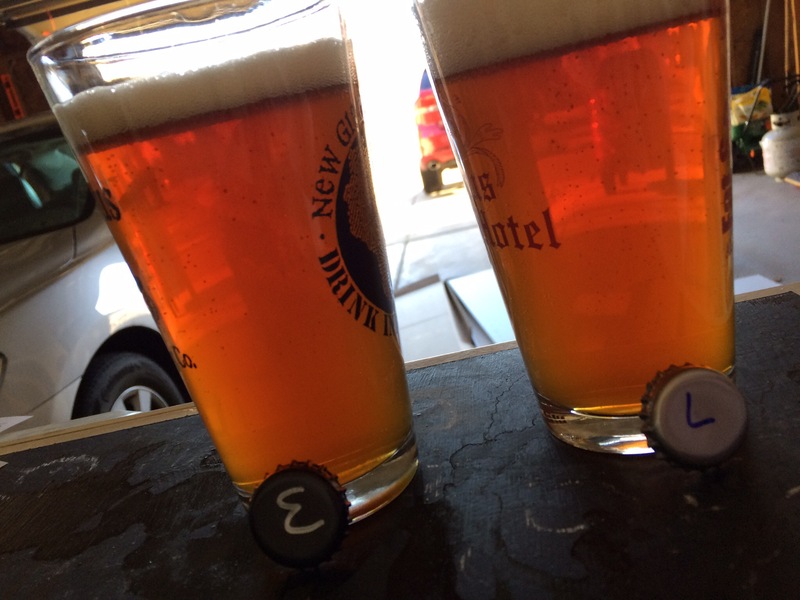 Both beers finished at 1.014 and were fined with gelatin, kegged and ready to serve. I went into this experiment with a high amount of skepticism. I stopped brewing with extract quite a while ago and didn’t really experience the issues people complain about with extract. As much as I wanted the results to be no discernible difference, I tasted a difference in most triangle tests. Appearance: No discernible difference, no one correctly distinguished this beer on color (check one for the kettle caramelization argument). I noticed a difference in head retention that no participants noted. The Early beer had finer bubbles and a head that lasted longer. Aroma: Some correct participants noted a sweeter aroma in the early while some noted a sweeter in the late. Most people didn’t note a difference in the aroma. I find myself consistently telling a difference on aroma alone, to me the aroma of the late is more floral and fresh. Flavor: There was no consistency in the comments regarding flavor. Some stated the early was less malty while some claimed it had more after taste (extract twang?). Some claimed the later addition was less bitter yet more astringent. The most common difference noted in flavor was an aftertaste difference. The Early seemed to linger longer it was noted. Mouthfeel: No reliable difference was noted. Conclusion: I found the results of this experiment to be interesting. The same amount of sugars were added to each wort, both had the same OG and FG, fermented the same, yet these beers are definitely different to me. When I taste these knowing which is which they are certainly not the same beer. I tasted and saw (biased) a higher quality beer in the early addition. To me the late beer tasted thin and blah. This test raises more questions than answers. 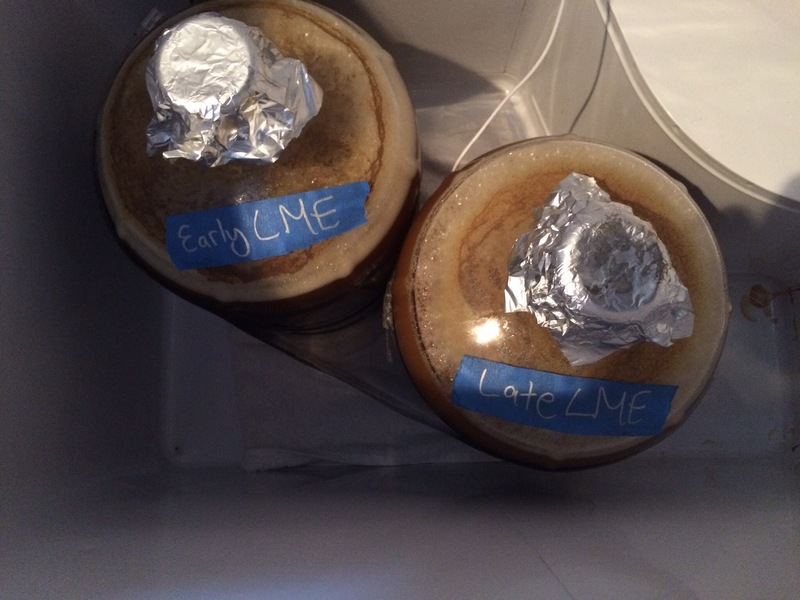 When looking side by side the late LME produces bigger bubbles and less head retention. 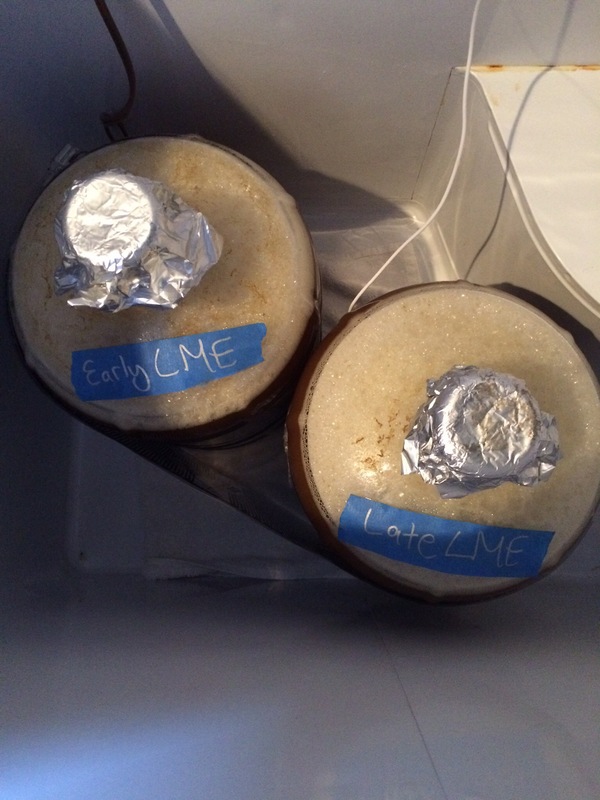 The early has amazing head retention (I was worried administering this test because the early beer head clearly sat up longer). I feel I can reliably tell the difference just upon sight, though I’ve failed. When my wife mixes up the samples for me and I taste them blind, without smelling, I’m about 50/50 which is close to the results of this test. On one hand Internet lore says add LME late for better flavor. On the other hand this test seems to favor the early beer more often, even though it maybe has extract twang. To me it just proves that hard and fast rules don’t really mean much. Yes these were different beers, yet the preferred beer wasn’t necessarily the late addition. I think I will be doing this test again with half early half late versus all early. Ugh no answers! Thanks for reading. Cheers! and as always let me know if you have any questions or ideas for comparisons. Aside, every woman correctly identified a different beer, score one for women’s palates! They say, generally speaking, a woman’s sense of taste and smell is usually better than a man’s–this is why it’s important to have a broad array of testers when performing an experiment!